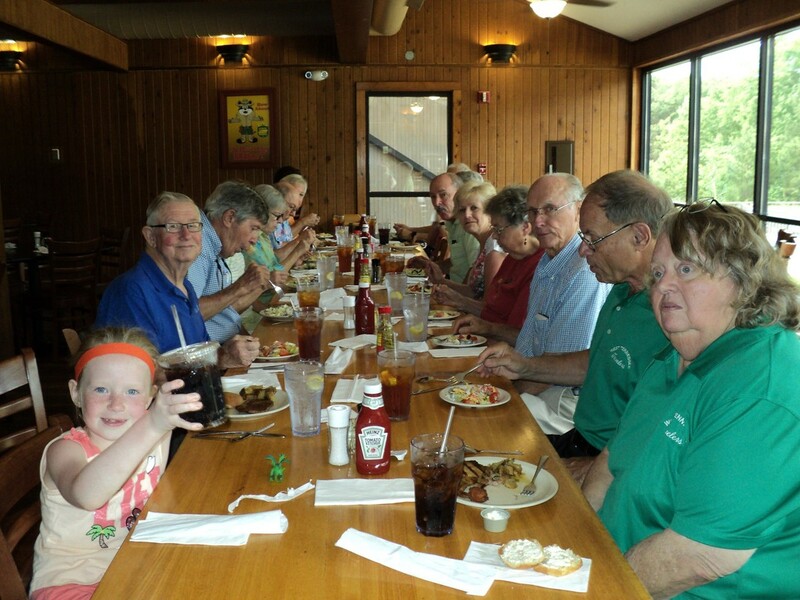 The West Tennessee Travelers held their June outing at Natchez Trace State Park, Lexington, TN. Eight units arrived Sunday prepared to enjoy one of our favorite campgrounds. We were joined by Vol State Winnies president and secretary Ralph & Virginia Wiggers. Our favorite camping area (Pin Oak Loop) is located on the banks of Pin Oak Lake. It is the largest (690 acres) of the 4 lakes within the park. Natchez Trace State Park gets its name from the Natchez Trace, a Natchez, Mississippi to Nashville, Tennessee trade route of the American frontiersmen during the late 18th and early 19th centuries. The threat of highway men along the Natchez Trace became so great that returning travelers began seeking alternate routes. One of the most often used was referred to as the Old Natchez Trace, which followed a route some fifty miles west of the main trace. 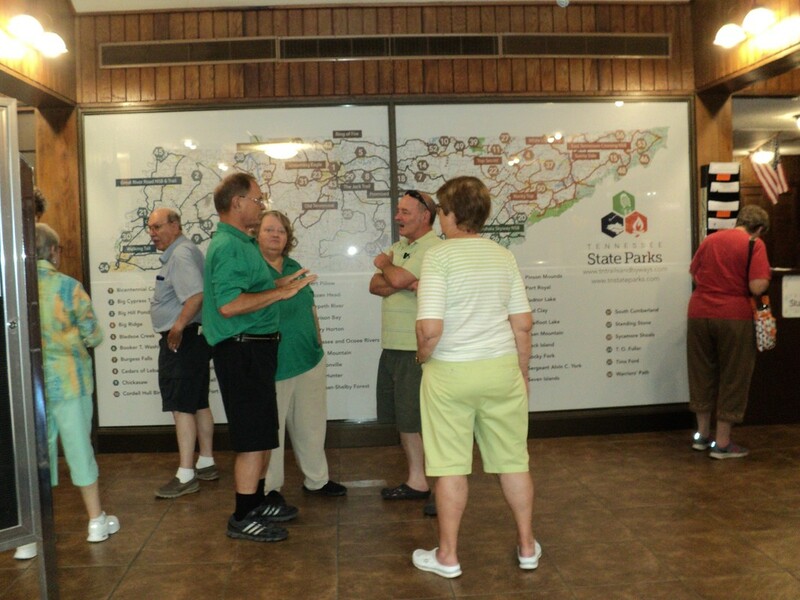 This alternate trace is now the Natchez Trace State Park and Forest. On Monday, our newly elected WTT president got her feet wet officiating at her first WTT meeting. Great Job Jeannette!! On Monday evening, the Shannons and Boldings provided the grills for our grill-out. 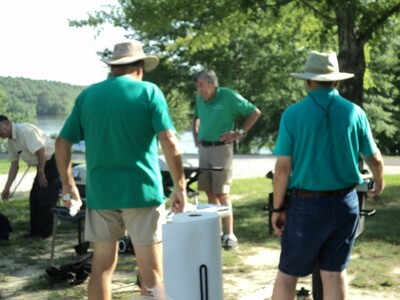 John & Sally furnished the sliders & rollers and the men did their thing with spatulas and tongs. Side dishes and condiments were provided by all. Afterwards, we enjoyed the relative cool of the evening while we discussed our problems and accomplishments since our last gathering. On Tuesday, we followed the shade at different campsites while we continued our conversation from the previous day. Jeannette and I spent a relaxing time with our granddaughter at the park swimming hole and managed to avoid getting sunburned. When evening meal time arrived, we carpooled to the Pin Oak Lodge for an excellent buffet. Of course, we couldn’t just eat and run so we gathered in the lobby and admired the exhibits and visited the gift shop. On Wednesday, no one had the urge to prepare a meal so we pooled our leftovers and gathered at the Shannons with our grilling meats. 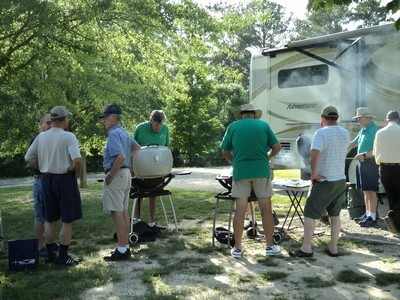 The men again got the opportunity to exhibit their grilling skills. A great meal guys!! Of course, Thursday marked another traveling day so we all had to say our goodbyes and head home. We also want to express our appreciation to John & Sally for a fine hosting. We are looking forward to another GNR at Forest City.